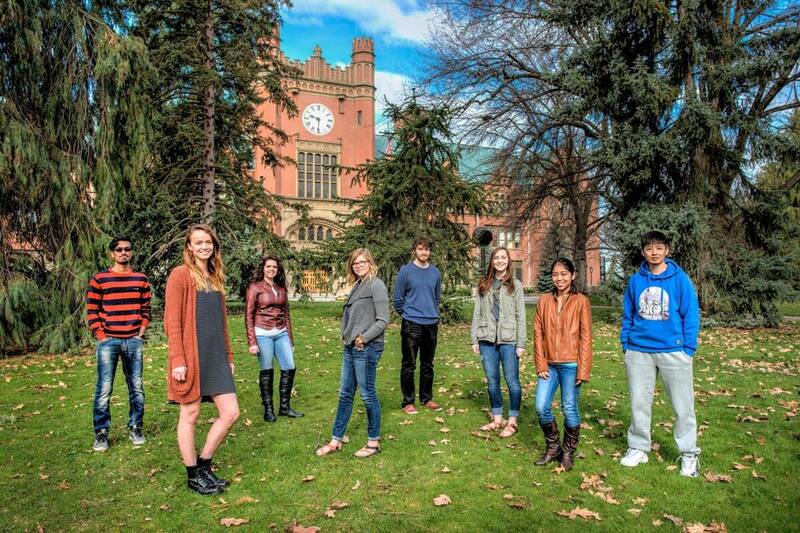 Vandals in Focus was created to showcase the remarkable undergraduate students at the University of Idaho and highlight the research and projects they are working on. Office of Undergraduate Research Director David Pfeiffer, who started the project, says it’s important to show off the wide range of opportunities at UI and the students taking advantage of them. "Through this project I wanted to increase the visibility of the many and varied undergraduate research activities taking place at UI," he said. It was also important to Pfeiffer that the creative talents of students be displayed in the work itself. Thirteen student writers and photographers created the stories in the Vandals in Focus print publication and website. "I wanted to provide an opportunity for a team of UI students to directly participate in the creative aspects of producing this publication. In essence, I wanted this to be a student-driven publication," Pfeiffer said. "I saw this as an opportunity to provide a talented group of undergraduates with hands-on, out-of-class experience related to journalism and the process of producing a publication. It is an experience that our students may not have been able to acquire as undergraduates elsewhere." Emily Lowe, a sophomore journalism major and a Vandals in Focus writer, appreciates the opportunity. "What makes this work important to me is that not only am I gaining experience for what I plan to do in the future, but we get the opportunity to share what’s important to other students on our campus," she said. "I think it’s awesome that it’s undergrad students writing and photographing what other undergrad students are researching. It really shows what this program is trying to do: showcase undergraduate research students doing projects the same way graduate students do." The process of creating a publication has its rewards, but also its challenges, Lowe noted. "It’s sometimes a challenge to get people to talk to you," she said. "Sometimes they are busy, other times they just don’t want to. I’ve been lucky so far that the students have been very open to meeting and talking with me." Yishan Chen, an international student from Kumming, China, studying physical education, was a photographer for Vandals in Focus. He has found his work challenging in another way — he has had to learn new vocabulary as he meets students in areas of study outside his own. But he sees, as Lowe and Pfeiffer do, how important the work is. "The students are very outstanding," he said. "They have done something very cool." Chen is careful about how he shows his student subjects through his photography, to properly illustrate their work. "I took over 80 photos," he said of one subject, an anthropology student studying artifacts in UI’s Bowers Laboratory of Anthropology. "I have to make a decision about what kind of photos I am looking for." Lowe and Chen were both surprised to discover the variety of research opportunities at UI. "It’s been awesome to learn about different research that’s happening on our campus," Lowe said. Pfeiffer hopes that UI students and future Vandals will have this same sense of discovery as they explore Vandals in Focus. "The intent of Vandals in Focus is not only to share some of the outstanding, student-driven research and creative activities taking place at UI, but also to help readers relate to the students conducting these activities," he said. "By focusing on the undergraduate researchers themselves, we hope to humanize research and show to other students that they too can get involved in these activities while at UI. Further, by highlighting student work from each college at UI, we want to give readers a glimpse of the wide spectrum of projects available to undergraduates at UI. " Pfeiffer is happy to be able to showcase brilliant undergraduates, but also recognizes the undergraduate writers and photographers. "What has been particularly rewarding for me is that it is the work of student writers and photographers that made this publication possible,” he said. “I am very proud of what our student team accomplished." Writer: Madison Billingsley, a junior from Covington, Washington, is majoring in creative writing and minoring in computer science. Her passions include writing, video games and sloths.